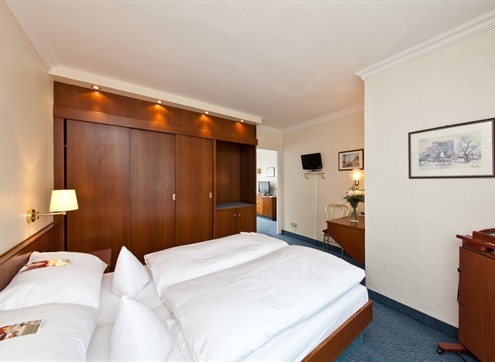 NOVUM Hotel Ravenna in close proximity to the Schlosstrasse and the subway station Steglitz! The central location in the middle of the capital allows both the business and the private traveler to reach all destinations in Berlin quickly and easily. The NOVUM Hotel Ravenna Berlin Steglitz is comfortably and contemporary equipped and is located in close proximity to the Botanical Garden. Functional rooms in different categories, free Wi-Fi and an extensive breakfast buffet await every visitor in a newly designed hotel. with money back promise On our homepage you always get the best price. For a cheaper offer we will refund the difference. Our Standard category offer approx. 16 sqm of comfortable living conditions in a harmonious environment. Room features & details: Equipped with a double bed or two single beds and shower/bath/WC, desk, Flat-Screen TV, telephone, free WLAN, free safe, sound-proofed windows and hair dryer. Non-smoking rooms available. Our comfort category offer approx. 19 sqm of comfortable living conditions in a harmonious environment. Room features & details: Equipped with a double bed or two single beds, an extra bed or a sofa bed for one person and shower/bath/WC, desk, TV, telephone, free WLAN, free safe, sound-proofed windows and hair dryer. Non-smoking rooms available. Our Family category offer approx. 29 sqm of comfortable living conditions in a harmonious environment. Room features & details: Equipped with a double bed or two single beds, an extra single bed and a sofa bed, shower/bath/WC, desk, TV, telephone, free WLAN, free safe, sound-proofed windows and hair dryer. Non-smoking rooms available. Our Queen Size category offer approx. 12 sqm of comfortable living conditions in a harmonious environment. Room features & details: Equipped with a queen size bed (1.40m x 2.00m) and shower/WC, desk, and shower/WC, desk, TV, telephone, free WLAN, free safe, sound-proofed windows and hair dryer. Non-smoking rooms available. Our category economy offers a comfortable living in the Harmonious ambience. Room Facilities & Details: equipped with A single bed and shower / WC, desk, TV with cable TV- Program, telephone, free W-LAN, free safe, Soundproof windows and hair dryers. All these rooms are located to the street. We support all standard online payment methods from PayPal and SOFORTÜberweisung to all major credit cards. Of course we also accept cost acquisitions. Here is a quick and realistic overview of all guest reviews on relevant portals. For this we rely on the competent support of Customer Alliance. This collects data on all rating platforms and summarizes these in its quality seal. Our Reservations Team is here to help you from 8:00 am to 9:00 pm to assist you with your hotel booking or to answer any related questions. You do not have a credit card? With us you can easily pay without credit card. Please contact us for your booking on our hotline +49 40 600 80 80 or choose an alternative payment method in the booking mask. Book online with us now and save 5%. When booking online, simply enter the booking code: novumdeal and receive a 5% discount on the current rate. In order to be able to replace possible financial losses in the event of cancellation of your holiday due to illness, accident or unemployment - even within the family - we recommend our partner's products ERV (Europäische Reiseversicherung AG), the market leader among travel insurers in Germany. Seniors aged 60 or over can benefit from special overnight rates. Save 10% on current rates when you enter the booking code senior2012. Please note proof of age is required on check-in. As a small thank you for staying with us, we will give you a booking code that will entitle you to 5% off your next booking at any NOVUM Hotel. Germany operates a system of clean air zones, or Environmental Zones, and to drive in one of these zones you need a special badge for your vehicle. In most of the cities where our hotels are located, you need the green 'fine particulate' sticker. These zones usually encompass the central areas of large cities, so they affect Berlin, Cologne, Munich and Frankfurt. In the Ruhr region, an extended Environmental Zone is in operation that covers several cities.